Bloody Spear at Mount Fuji (Tomu Uchida, 1955) – Make Mine Criterion! The Criterion Collection, a continuing series of important classic and contemporary films presents Bloody Spear at Mount Fuji. Already established and celebrated as an exemplary filmmaker in the 1920s and 1930s, Tomu Uchida returned to Japanese cinemas after a near decade-long absence in Manchuria to make Bloody Spear at Mount Fuji, a compassionate tale about a lowly lancer named Gonpachi (Chiezô Kataoka) who travels with his young samurai master and another servant to Edo along the Tokaido road, repeatedly encountering the same peasant travelers. A community is gradually formed between them as they become familiar with each other and their personal struggles despite the class barriers that separate them. Made with assistance of fellow filmmakers Yasujirô Ozu, Kenji Mizoguchi, Daisuke Itô, and Hiroshi Shimizu, Bloody Spear at Mount Fuji is a picaresque story that deftly blends humor and drama to reveal the contradictory nature of Japanese society and stands as one of master director Tomu Uchida’s greatest films. PLUS: A booklet featuring a new essay by scholar Tony Rayns and an excerpt from Donald Richie’s essay “Rediscovering the Work of Tomu Ichida” written for the 2004 Tokyo FILMeX International Film Festival. If you’ve never heard of Tomu Uchida, it’s not surprising. 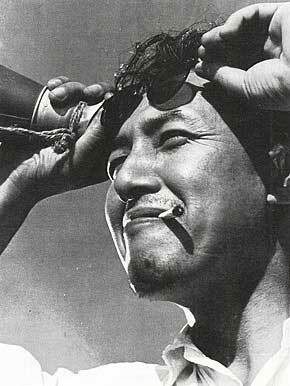 Despite being a celebrated filmmaker in his native Japan, Uchida is virtually unknown in the West. In fact, only Uchida’s Miyamoto Musashi series has been released in North America. If you have heard of Uchida, it likely that you have been lucky enough to see the film retrospective on the director arising out of the 2004 FILMeX in Tokyo. If so, then you are already aware of Uchida’s versatility, his admiration of people from all stations of life, and his ambivalent, at times despondent, view of Japanese society. Uchida is most frequently compared to American director Anthony Mann given his ability to ably work across genres, his intelligence and technical proficiency, and his robust scenes of macho action. Bloody Spear on Mount Fuji (Chiyari Ueki) is notable for being Tomu Uchida’s return to feature filmmaking in Japan after a prolonged absence in Manchuria lasting from 1945 to 1953. Uchida was purportedly born into a wealthy family that quickly lost its fortune and, after brief careers in the military and in piano-tuning (providing the young man with opportunities to mix with individuals of all sorts and classes), he had a distinguished film career through the 1930s, directing many celebrated classics of the era. After an extended visit to Manchuria in 1943, Uchida’s strong nationalism and a declining domestic film industry had him return in 1945 to work at the Manchurian Film Cooperative until 1953. He arrived back in Japan in 1953 among the final group of returnees. He was in ill health, was uncertain about his future in the new Japanese film market, and had become more ambivalent about his country’s national character following ten years of violence and disorder. His first film since his homecoming was Bloody Spear on Mount Fuji, an ensemble piece that synthesized Uchida’s views on the contradictory nature of his homeland. The film opens by introducing a socially diverse cast of characters traveling across the screen under a painted backdrop standing in for Mount Fuji. The tension demonstrated in this opening image between the tradition, nostalgia, and symbolic status associated with the national landmark and its obvious falseness or thinness will be a recurring theme of Bloody Spear on Mount Fuji. Traveling along the road is Sakawa Kojurô (Eijirô Kataoka), a young samurai on his way to visit his mother, journeying in the company of his servant Genta (Daisuke Kato) and his spear-carrier Gonpachi (veteran Toei star Chiezô Kataoka). By providing his own ointment with Gonpachi to treat a blistered foot, Sakawa is established early on to be a good-natured individual able to occupy his superior social station with care and flexibility. Sharing the roadway with the trio are wandering street performers Okin and her daughter (played by Chiezo’s daughter Chie Ueki), a young orphan boy fascinated by Gonpachi (played by Chiezo’s son Motoharu Ueki), a nervous traveler named Tozaburo (Ryunosuke Tsukigata) who hides a cache of money, a young woman named Otane (Yuriko Tashiro) on her way to being sold into servitude by her father Yomusaku, a blind masseur, a pilgrim (Eitaro Shindo), and a police officer named Denta who searches the roadways for a notorious tattooed thief. And while Gonpachi, Sakawa, and Genta are the focus of the film, Uchida treats all these characters with equal relevance and dignity, interlocking their stories and playing with their differing social classes within the setting of the generally egalitarian roadway – Gonpachi teaches the orphan how to carry a spear, Okin and her daughter perform a musical number when the small girl acts out the duties of a samurai’s attendant, and all the travelers occupy together the same inns, even the same single rooms, along their journeys. In doing so, Uchida emphasizes his warmhearted admiration for the traditional Japanese social structure, but also reveals its arbitrariness and performed nature with playful good-spirit. Bloody Spear on Mount Fuji brings together the contradictory nature of these social arrangements in a gently tragi-comic convergence of plots. Observing the plight of Otane and her father, Sakawa secretly attempts to pawn his family’s spear to raise the funds to help them and discovers it is a valueless forgery. Upon returning with Gonpachi, they accidentally apprehend the thief who has been masquerading as the pilgrim, however the credit for the capture is given to Sakawa only and the reward is nothing more than written commendation – Sakawa notes a fake spear earns only a fake reward. Meanwhile, Tozaburo is revealed to be on his way to pay out his daughter’s debt and conclude her indentured servitude, but he discovers she died 2 years earlier and his hard work in a mine to scrape together the necessary funds are now for nought. Broken-hearted, Tozaburo, with the help of Denta, spends his fortune to redeem Otane and save her from the same fate as his daughter, returning her to her Yomusaku. Compassion abounds in this portion of the film and Uchida blocks and sutures these sequences to emphasize the found community shared between the travelers. During the sequence where Otane and Yomusaku lament their plight during the early-morning hours just before her sale, Uchida ensures a depth of field to depict Okin’s saddened gaze in the background and inserts shots of Sakawa’s frustrated observation from farther back in the room. Bloody Spear does not privilege its travelers between each other. Sakawa, Tozaburo, and the orphan are all shot in a consistent manner. In rare instances, Uchida’s camera rises above street level to shoot scenes of greater standing, such as a makeshift, roadside tea party between 3 feudal lords or the reward ceremony following the thief’s apprehension. Yet, in each instance, these venerable scenes are ultimately undercut by the lack of a true reward, as in the reward ceremony sequence, or by the stench of a young boy’s diarrhea and a rain shower, in the case of the roadside tea-drinking. The airs of status are frequently dispelled in Bloody Spear on Mount Fuji in favour of the recognized ironies and shared humanities of its travelers. Uchida is sometimes called a nihilistic director, particularly for the second half of his film career in Japan, and Bloody Spear ends with a violent and tragic end fitting to the road movie mode. Moved by the action of Tozaburo and disappointed by the failures of his class and himself to provide assistance or understanding to those in need, Sakawa takes Genta to share a drink, breaching established social norms by having the servant sit and drink sake with him, and raising the ire of a group of loutish samurai who take offence at the apparent disrespect to their class. The overall peacefulness of Bloody Spear is wound up in a flurry of bloody, desperate violence that concludes with Gonpachi exacting brutal vengeance and returning to the road alone. Uchida presents the sequence with nearly no accompanying music, much as he does with the portion involving Otane, allowing for noticeable stretches of silence that hearken back to his silent career and emphasizes the shared, unadorned reality we occupy. The conclusion is less nihilistic than it is conflicted and tragic. The deaths are unromantic. The desperate, unpolished swordplay displays none of the samurai’s grandeur. Gonpachi is admirable for his loyalty and fortitude, aspects inherent to the Japanese social system, but their display is caused by the small-minded and divisive concepts of status and honor enabled by that system. While Gonpachi’s actions are a blow against indifference and cruelty, they are ultimately unrewarding. The solicitous community found on the road has no place off of it. A fake spear is no less deadly and men of differing station lie dead in pools of sake all the same. The Criterion Collection has some precedent for following FILMeX retrospectives and rediscoveries. In 2003, FILMeX reintroduced film fans to Hiroshi Shimizu and Criterion followed suit with a corresponding Eclipse set. And with the Collection now at 2 years since bestowing a spine number on a new Japanese title, both Criterion and Uchida are ripe to find each other. Bloody Spear on Mount Fuji is an excellent starting point, marking the start of Uchida’s most successful period and standing among the very best examples of his work. We’ll cast against type for a cover treatment by suggesting We Buy Your Kids, the collective name for Australian artists Sonny Day and Biddy Maroney. 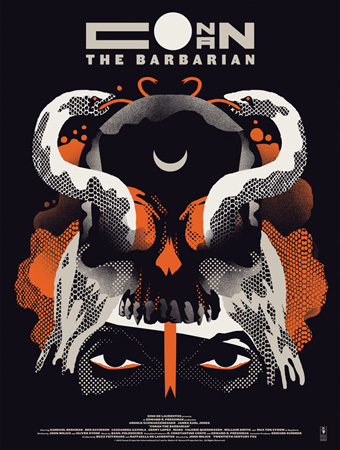 Their graphic style artwork would interestingly contrast with Uchida’s 60-year old film, and their Conan the Barbarian (John Milius, 1982) poster suggests them ably capable of crafting an iconic cover for Bloody Spear on Mount Fuji. Credits: Interviews were an easy choice given Tadao Sato, David Bordwell, and Kristin Thompson’s past contributions to the Collection and their already expressed interest in Uchida films of the 1930s. Tadao Sato has specifically written about Uchida in various contexts including his books Chanbara Film History and Japanese Film History. Tony Rayns is another regular contributor to the Criterion Collection, particularly with regard to Japanese cinema, and was a natural selection here given his involvement as a panelist during the BFI’s 2007 retrospective on Uchida. And with Donald Richie no longer with us to lead the way with Criterion’s Japanese selections, it seemed apt to include his essay on Uchida from the 2004 FILMeX catalogue. Lastly, a very special acknowledgement should be given to Craig Watts’ essay “Blood Spear, Mt. Fuji: Uchida Tomu’s Conflicted Comeback from Manchuria (1955).” Virtually every English-language discussion on Uchida refers to Watt’s well-researched article. Those looking for greater detail on the filmmaker’s time in Manchuria and on the social context and commentary within the film will find the essay invaluable. Next Article Film Fest Envy! Pingback: A Fugitive from the Past (Tomu Uchida, 1965) | Make Mine Criterion! Great write up! Do you know of any way to get ahold of Donald Richie’s filmex essay? I found Erika Gregor’s, but can’t seem to track down Richie’s. Also, on the off chance that you’re interested, I’ve tracked down a bunch of essays on Uchida from various professors around the U.S. that I don’t think is available to the public (I’m working on a project on him myself). I’d be happy to trade resources. Thanks for the kind words. Sadly, I couldn’t find Richie’s essay. And so, while I’d certainly be interested in your research, I’m afraid I don’t have much to trade. No worries. Shoot me an email, I’ll give you what i’ve found. To be honest, I think I’ve collected just about everything written about him in English (plus some bonus stuff, too). I need to get a life. Hope to hear from you, and keep up the awesome work. I freaking love both the concept and your execution. Great site all around. I don’t know if my second comment posted or not, or if this is a do-not-reply address… anyways. Yeah I’d be happy to give you what i’ve got. I think I’ve gathered up just about every relevant English word on the guy, plus some bonus stuff you might really like. Some of it’s online, but some I had to get freaking university professors and Uchida’s damned great grandson to send me some stuff, so I’ve got a bunch of stuff on Google drive that I could share with you. Let me know.